Head to the barn at the end of the property. 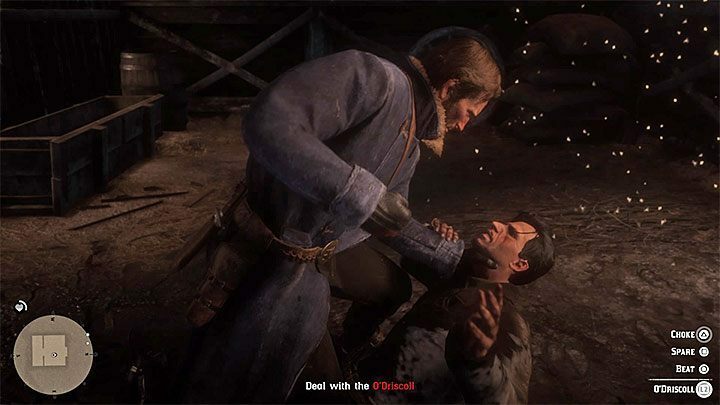 Beat the O’Driscoll in a fist fight. Question the O’Driscoll 2 times. Choice: Spare the man or choke him to death. Pick up your gun and your hat. Pet the horse to calm it down. Lead the horse out of the barn. Head back inside the house. You will be given a choice to choke the O’Driscoll to death or spare his life. Choosing any of them has no difference so this is all down to preference. I’m having the same problem did you ever figure it out?